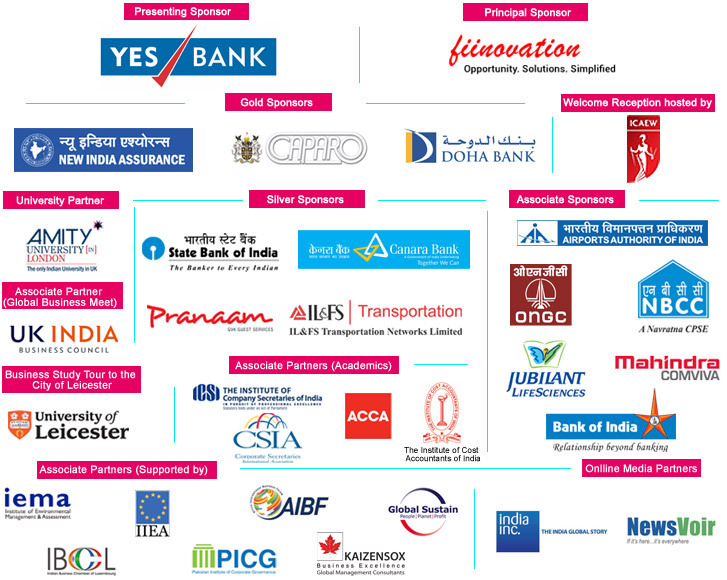 A unique international forum to discuss latest issues on corporate governance, sustainability, CSR & boardroom issues . Network with over global top 100 organisations and 250 leaders . Listen to global thought-leaders, as well as experienced best performers. 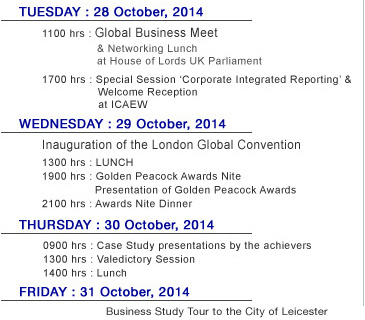 Global Business Meet & Lunch at House of Lords- UK Parliament on 28th Oct.
Join the achievers at the most prestigious GOLDEN PEACOCK AWARDS Nite and Banquet on 29th Oct. Invitation for Networking with Global businesses & Lunch on 30th Oct.
Special presentations from European Commission & Peterborough on delivering true 'Smart Cities' for economic growth and business sustainability. Significant academic contributions from the HEADS of ICAEW, ACCA, ICSI, ICAI, ICSA, CSAI, CCAB, Greenwich University, Aston University , University of Leicester, Amity University & London Business School. Special panel discussion on ' The emerging Role of Company Secretaries' , moderated and chaired by Prof Andrew Kakabadse, (world’s top 50 business thinkers).Company Secretary Professionals of India (ICSI) entitled to claim 8 (Eight) Programme Credit Hours. Cost Management professionals of India (ICAI), (a partner) entitles 10 (Ten) Programme Credit Hours. Conference Kit with Convention Souvenir, Proceedings covering all presentation papers and Winners' Digest covering major Governance & Sustainability initiatives of Golden Peacock Award winner organization for the year 2014. Vice Chancellor , University of Leicester & Ex Chief Executive of the Economic and Social Research Council and President of Science Europe. Chief Mentor, Maruti Suzuki India Ltd.
Chairman & Managing Director, Telecom Consultants India Ltd.